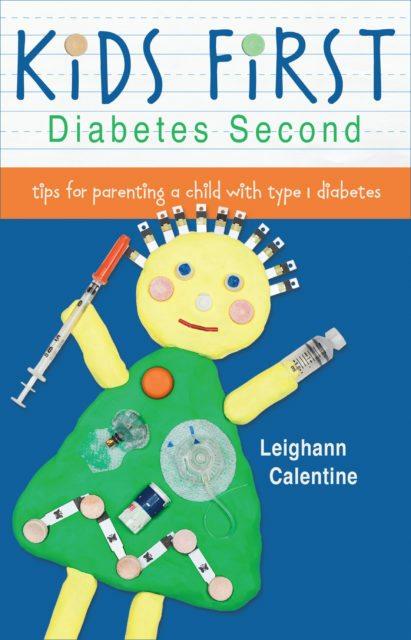 Here are some ways to prepare for the school year when your child has type 1 diabetes including gathering supplies, creating a two-page instruction sheet, and teacher training. I remember in the weeks before my daughter Q started kindergarten I was anxious. 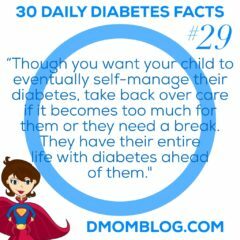 But sending your child with type 1 diabetes to school is just another instance where parents need to do as much preparation and training as they can to have the confidence to let go on that first morning of school. I know other parents cried as their child said goodbye, climbed the steps, and walked through the door. For them, it was a simple separation. For us d-moms and d-dads, we wonder if our child will actually make it through the day unscathed. I didn’t cry that first morning, as much as I had a right to, but I had to believe that she would be okay. Preparation begins for our family in the weeks before school starts. 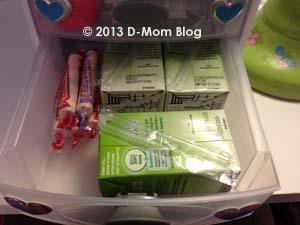 I begin gathering our diabetes supplies and filling the kits we keep at school to manage her diabetes on a daily basis. I call the assistant principal to set up a training session with staff, which takes place ideally before the first day of school. 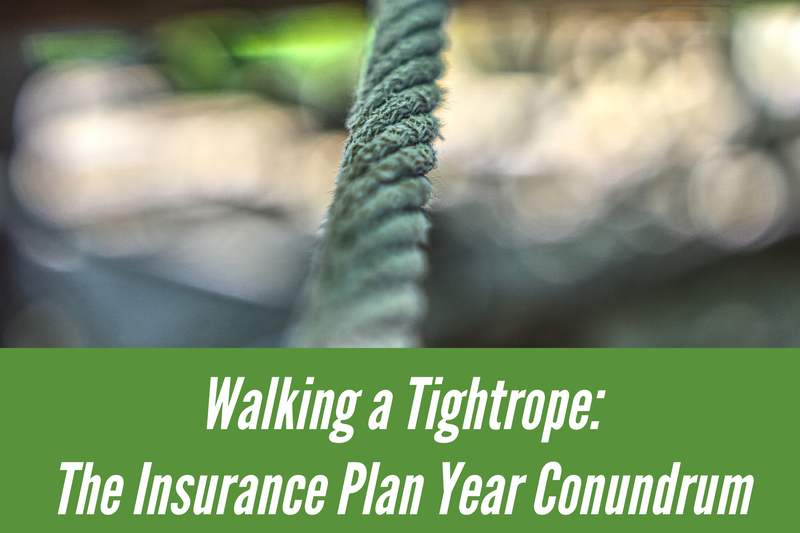 I fill out any paperwork that the school district needs, update my two-page instruction sheet and take a look at our 504 plan to see if there have been any changes that need to be addressed. The two-page instruction sheet I update each year has two purposes. First, it highlights some of the main points and serves as a guide as I train the staff who oversees my daughter during the day. Second, it’s a quick reference for substitute teachers because it’s always included in their lesson plan (this is specified in our 504 plan). When Q was in kindergarten, I always brought her to morning line-up. If there was a substitute teacher in her classroom, I walked right up to him/her and said, “This is Q. She has diabetes. Please read over her instruction sheet and don’t hesitate to get the nurse or assistant principal if you have any questions about her care.” Then beginning in first grade, I often gave Q the independence of being dropped off in the car line and didn’t always know if there was a sub. That’s why the two-page instruction sheet became so important. Our instruction sheet has a photo of Q in the upper right corner so the teacher, sub, or another staff member can easily identify which child she is and note that she requires special attention. The front of the sheet explains low blood sugar symptoms, treatments, and follow-up care, including when to call 911 for severe hypoglycemia and how to use glucagon. 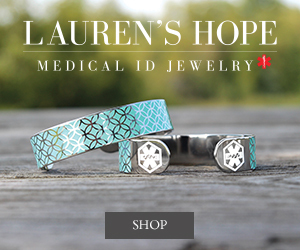 The backside describes high blood sugar symptoms and protocols. I also include any other considerations, such as free access to water, the bathroom, and office. In big type at the bottom of both sides are mine and my husband’s cell phone numbers. Staff members I include in the diabetes training session are the assistant principal, classroom teacher(s), art, music and gym teachers, the librarian and, of course, the school nurse. 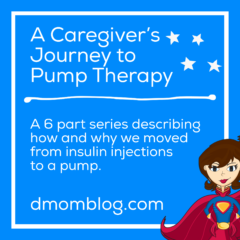 For some, the diabetes training serves as a review. But it’s brand new for the classroom teacher each year. 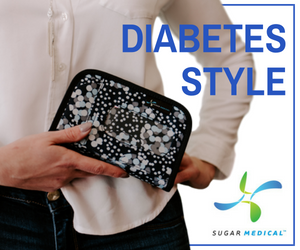 During the diabetes training, I go over the instruction sheet, point out important considerations in our 504 plan, and demonstrate how to check blood sugars and use glucagon. I admit that I get a little shaky as I demonstrate the glucagon each year because if they have to use it, it’s a serious emergency situation. If you’re anxious or nervous, understand that the classroom teacher probably is as well. I think the biggest key is to provide information without overwhelming them, but assure them that they can do this and if they have any questions — no matter how small — you are just a phone call away. 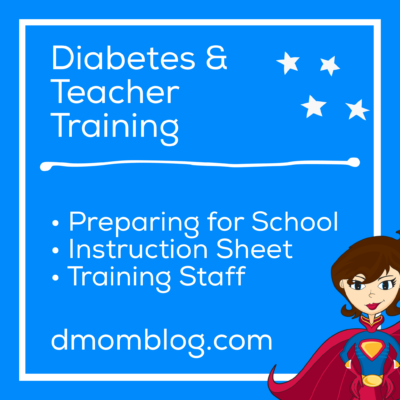 “Diabetes & Teacher Training” originally appeared on Insulet’s Omnipod Suite D blog, now called Podder Talk. In full disclosure, Insulet compensated me for the content that I created for them, but I am not being compensated for sharing it today. 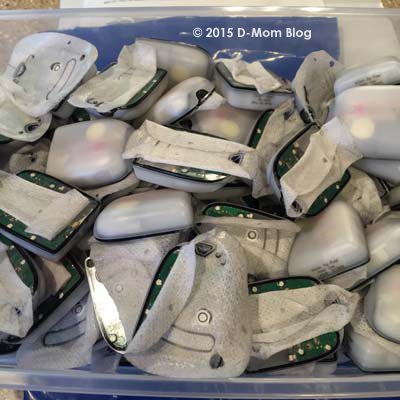 Diabetes management produces A LOT of trash. A lot. And much of it can’t just go into the garbage and then into the landfill (or shouldn’t). One item that shouldn’t go into the landfill are batteries. Some states have regulations on how you can and can’t dispose of sharps (syringes). Our local pharmacy used to have a free sharps collection program, but when they were taken over by a national pharmacy that was one of the first things to go. We have always participated in Insulet’s pod recycling program. Over the years I’ve heard many people grumble that they didn’t want to spend the few bucks that Insulet asked to cover the cost of shipping. 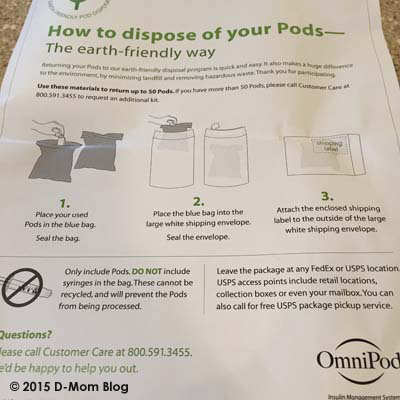 When I ordered pods last time, I asked them to include a couple of recycling bags. I was happy to hear that there is no longer a charge for the recycling program. What’s even better is now you can put the return package into your mailbox instead of taking it to a retail location, which is much more convenient. We filled two entire recycling bags with almost a year’s worth of pods. 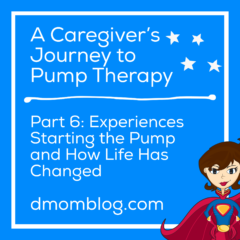 That’s a lot of pump changes! 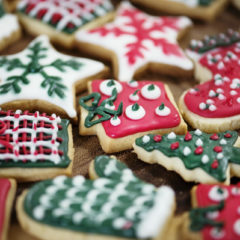 Disclosure: I have been a freelance writer for Insulet’s Suite D blog, but they did not ask me to write this and I am not receiving any sort of compensation. Just passing this along! Please read my disclosure statement. 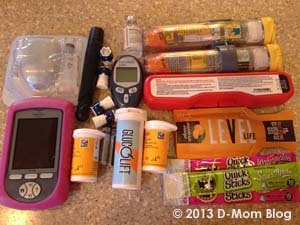 My daughter’s nightstand was becoming overrun with new and used diabetes supplies. I usually check her blood sugar around 10:00 pm or so, before I go to bed, and of course any time that the DexCom alarms in the night. 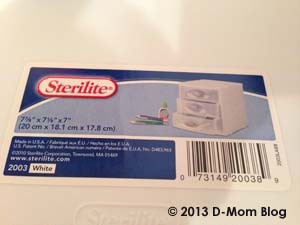 I wanted to tidy it up a little and found this Sterilite three-drawer organizer at target for around $6-7. 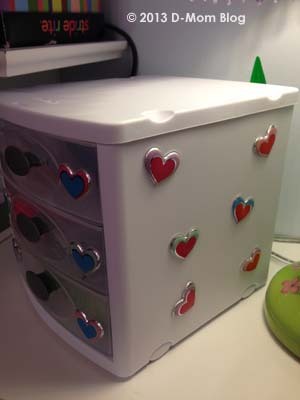 Q picked out some puffy heart stickers to fancy it up a little. 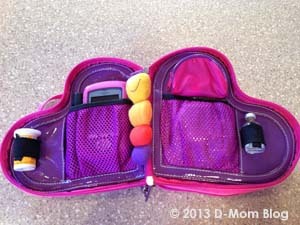 We use her OmniPod PDM to check her blood sugar and she brings that up at bedtime. 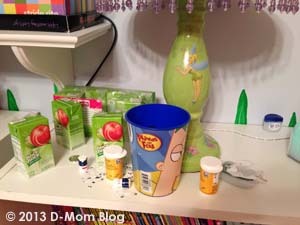 What do you keep on your child’s nightstand for testing and treating overnight? 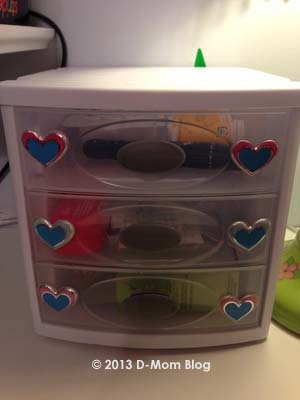 How do you keep it organized? 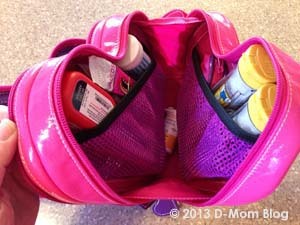 We received a Love Bug bag from Myabetic sometime ago, but it just wasn’t big enough to hold ALL the d-stuff we schlep everywhere. 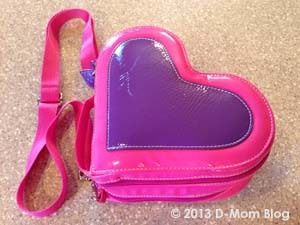 I was excited to see a sample of the redesigned bag when we were in Florida for Friends For Life last summer. They’ve doubled the size and added a shoulder strap, which makes it a great improvement for us. Now that we are also carrying an EpiPen (stupid tree nut allergy! ), we have so much to try to pack into one bag. We are making it work. Though because it’s over-filled, I have not been squeezing a juice box in for fear of an explosion. 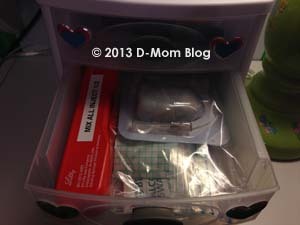 One thing that I would really like is a universal clear strap, similar to the one in the Sugar Medical Supply OmniPod Bag or Sugar Bag, instead of one of the mesh pockets. 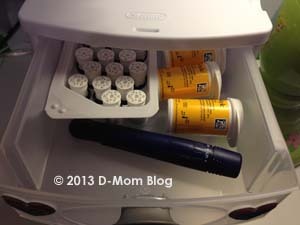 We actually prefer to keep the OmniPod PDM in place and not take it in and out to test. 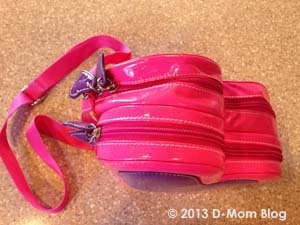 And there was no way to really fit our Sugar Medical Supply pouch in, though I may try to rework it at some point. And I actually ended up taking one of the removable zipper pouches out so that we could more easily get the PDM in and out (it’s still a tight fit). I covered the velcro with some clear tape. I felt like I was playing Tetris as I tried to fit all our stuff in, LOL! Overall, we’re pleased with the bag. The quality is good. I think if we didn’t have the EpiPen we would have room for snacks. In fact I need to squeeze an inhaler in there, too. They also offer a boyish bag. Though my sports loving daughter might love it, too! 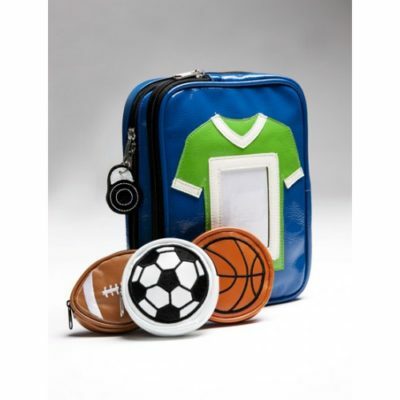 The Love Bug retails for $42.95 and the Champ Sports Locker is $39.95. Disclosure: Myabetic provided me with this product for review consideration. Monetary compensation was not received and opinions are my own. Please read my disclosure statement. Normally we travel as a family by car. 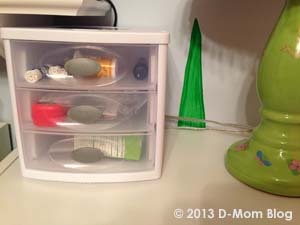 When we do, I usually grab our preparedness kit because it contains all the supplies we might need. If we will be gone for more than a few days, I throw in additional test strips and pump supplies. When Q and I went to Children With Diabetes Friends For Life, we flew. This was Q’s first time on a plane and while I fly somewhat frequently, it was my first time flying with diabetes supplies. I gathered what I thought were enough supplies for six days away from home, but after chatting with friends on Facebook, I threw in a few more pump supplies…just in case. 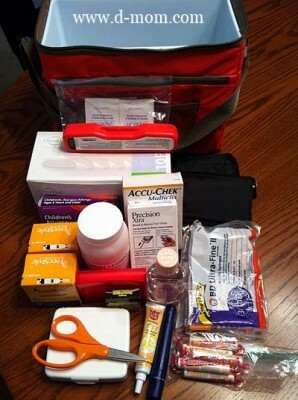 I thought I had read on the TSA website or the airline I usually use that diaper bags and medical supply bags do not count as your personal item so I decided to pack all of our supplies separately from our other travel stuff. (I can’t seem to find a link to the exact place where I read that, so don’t take that as gospel!) I picked up a red cooler at Walgreens for $12.99. It is soft-sided, but it had a hard plastic insert. I liked the insert because supplies could be stacked and wouldn’t get smooshed. Admittedly, most of the supplies came right back home to be restocked in my supply cabinet. But I had them if I needed them. We did have a bad pump site the first night in the hotel which required a couple of blood ketone checks, a fresh vial of insulin, and an extra pod.